Our New London Diamond Way Buddhist Centre project has a new home online – www.buddhism-london.org. It’s the place to go for news and information about the latest progress in the project to buy and renovate the beautiful old building in Lambeth that we plan to convert into our newest Buddhist meditation centre for Diamond Way, the Beaufoy Institute. It’s also the place to go if you’re curious how to support the project. For example, if you’d love to support us in a personal way, you can sponsor some coffee cups to help keep sleepy meditators awake – or a Buddha statue for the large meditation hall in the new Buddhist centre. You can choose from these items and more at our online wishlist. 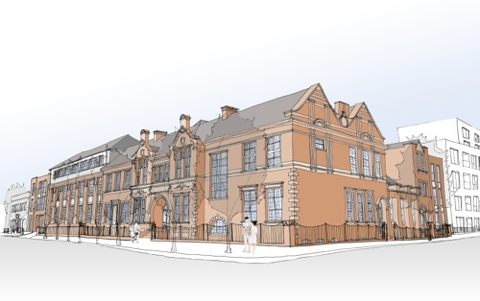 Lambeth Council agreed that this proposed use of the Beaufoy Institute as a Buddhist centre will provide significant community benefit. Read more about the historic decision on our UK Blog post about the planning permission for our new London Buddhist Centre. Diamond Way Buddhists are always visiting the Buddhist centres of our friends across the globe – from Irkutsk to Berlin, from Hamburg to Sydney – where they have rebuilt old factories, transformed abandoned buildings and rejuvenated communities. They have found a way to combine the compassion and wisdom of Tibet and ancient India with the critical Western view. This is what we want for London – the new Buddhist meditation centre at the Beaufoy will be a focus of authentic lay Buddhism, presented in an accessible, dynamic and living way. It will have facilities that will enable education and research, and will attract many visitors and a lot of interest in the KOV (Kennington, Oval, Vauxhall) area. We were recently featured on the international Diamond Way Buddhism website, on the occasion of the planning permission for converting the Beaufoy Institute into a Buddhist meditation centre having passed the statutory waiting period. You can read the article at http://www.diamondway-buddhism.org/buddhist-centre-beaufoy-lambeth/.